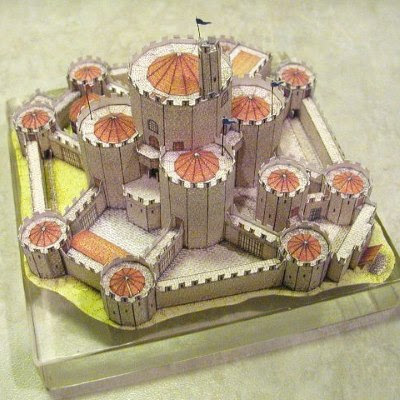 The template for this miniature papercraft castle originally appeared in the June 1984 issue of Dragon Magazine, a publication dedicated to the subject of role playing games. The official name of the castle is "The High Keep of the Grand Chapter of the Order of St. Raphael". However, to keep things short it was given the nickname "Great Stoney". An scanned copy of the magazine containing the castle template may be found here. In certain European countries, the Feast of St. Nicholas is celebrated on December 6th. In many of these countries, "Krampus Night" (in German Krampusnacht) is celebrated on December 5th. Whereas St. Nicholas comes to bring good children presents, Krampus comes to bring naughty children coal. Krampus also carries a bundle of birch branches in order to swat those children that are particularly naughty. Extremely naughty children are carried away to Krampus' lair. 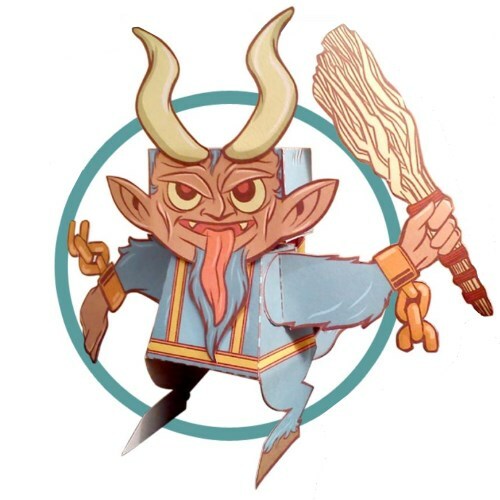 This paper toy Krampus was created by Trystan Mitchell and may be downloaded here. This life size paper model is of the Elvenking's sword as it appears in the Hobbit movies directed by Peter Jackson. The Elvenking's name is Thranduil. He is the father of Legolas, an elf played by Orlando Bloom in both The Hobbit and Lord of the Rings trilogies. PDF and Pepakura PDO templates for the sword may be downloaded here at the DeviantART page of MorellAgrysis. The 3D models from the Lineage II video game make for some pretty cool paper models. This 12" (31 cm) tall papercraft is of a female knight character from the game. 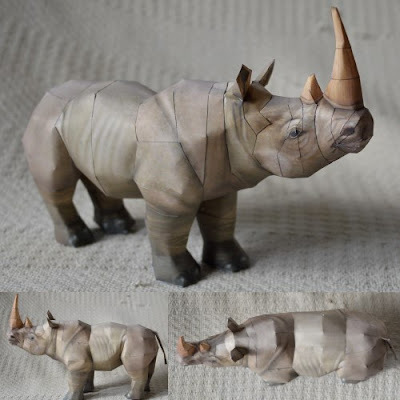 The Pepakura PDO template for the model may be downloaded from Thailand-Namotasa. Lineage II was released in 2003. Lineage Eternal, the next game in series, was set to be released in 2016, however delays have pushed the release date back to 2017 at the earliest. This free papercraft diorama of Santa's workshop complex at the North Pole was created by the folks at Papertoys.com. 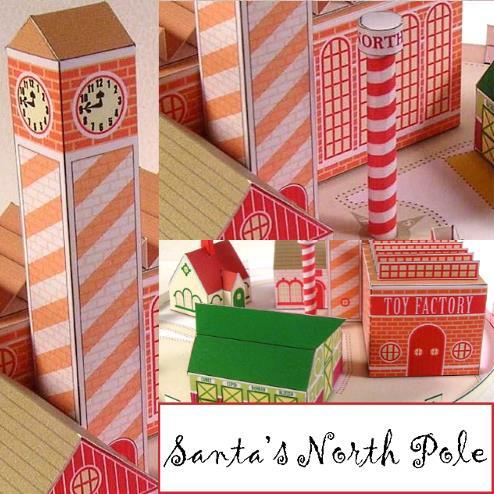 The set includes Santa's house, a reindeer barn, a toy factory, Santa's office, a clock tower and a North Pole marker. To give you a idea of the size of the completed diorama, the entire complex fits in a circle about 8" (20 cm) in diameter. The Christmas Village Displays website offers a free collection of eleven simple papercraft buildings that are suitable to build with young children. Most of the templates in this easy-to-build set have only one piece. 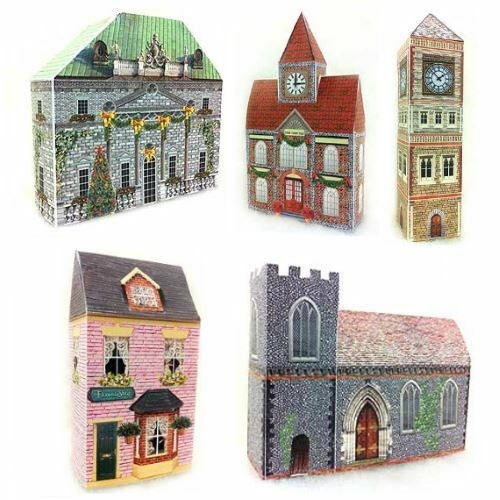 Pictured are a sampling of the buildings available in the collection: A hotel, a town hall, a clock tower, a flower shop, and a church. There are eleven paper models in all. 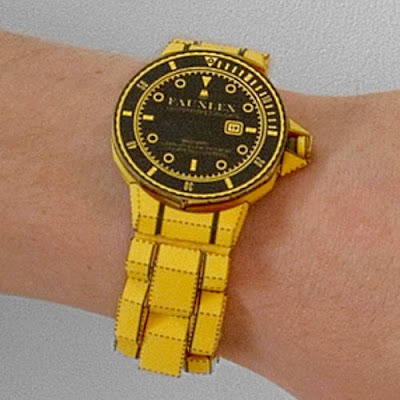 I am not entirely sure why someone would want to design a paper model of a faux Rolex watch, but then again who am I to talk? ;) The template for this model has no color, so to achieve the effect seen in the photo it must be printed on gold colored card stock. A download of the watch is available here. Photo and papercraft design by Matthew Nicholson. Here is another nicely detailed paper model based on a 3D model from the Zoo Tycoon 2 video game. This time we have a white rhinoceros! White Rhinos were once on the brink of extinction. But through conservation efforts their numbers have increased. The species is still, however, in danger from poachers. The template for this papercraft may be downloaded here. Christmas origami is not all that common, but here is one cute example: an advent calendar! 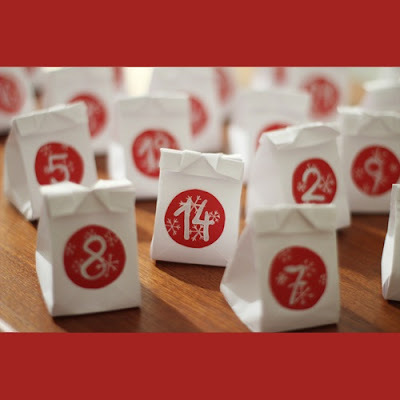 This creative calendar consists of tiny origami bags that can be filled with treats. The bags may be scattered across a table top as is shown in the photo or they may be pinned to a string and hung like a garland. Information on how to construct the calendar may be found on the DIY blog, Look What I Made. Instructions and a template may be downloaded here. In 1983, Atari released a Star Wars arcade game. The game came in two versions: the ordinary stand up version and an innovative cockpit version. 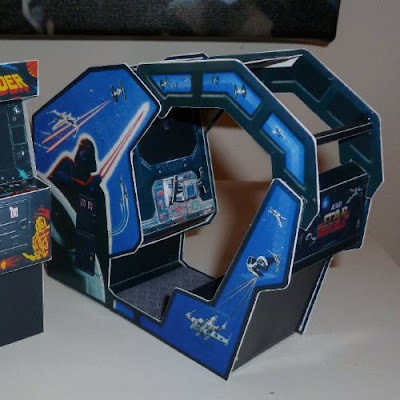 This mini paper model of the cockpit version of the game was created by Greecab at the Arcade Controls forum. The papercraft template for the model may be downloaded here. Today marks the eighth anniversary of Tektonten Papercraft! It has been my practice on anniversary day to take a look back at my papercraft designs from bygone years. With the release yesterday of the Doctor Strange movie, the choice of which paper model to feature this year seemed obvious. 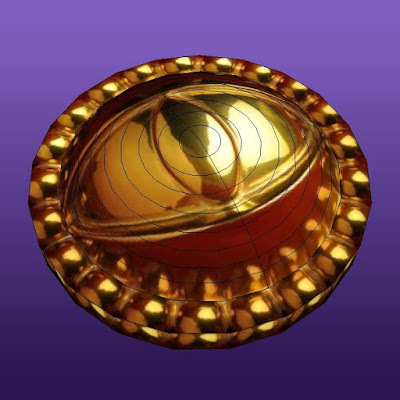 This model of Doctor Strange's Eye of Agamotto was originally released 7 1/2 years ago. It is one of my first papercraft designs! The original post with a download of the template may be found here. Thank you everyone for your support over the last eight years! 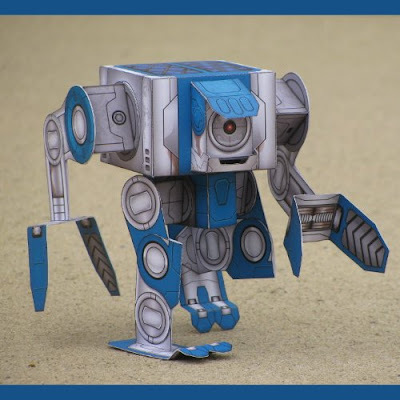 These papercraft robots look a little sinister, just the thing for a table top Halloween decoration. The fun thing about the robots is their parts are interchangeable. If I were six years old I would be playing with these for hours. 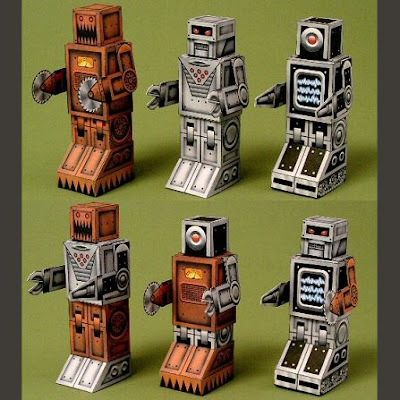 ^^ The printable PDF template for the robots may be downloaded at Ravensblight. 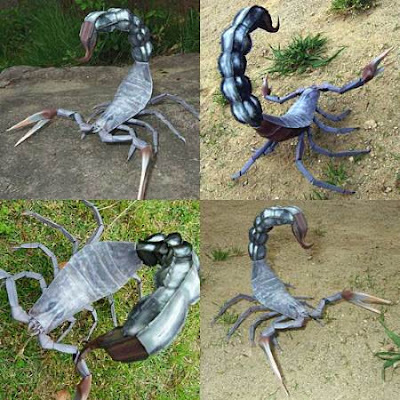 I think scorpions are one of the creepiest animals on the planet, so you will never find me building this paper model. 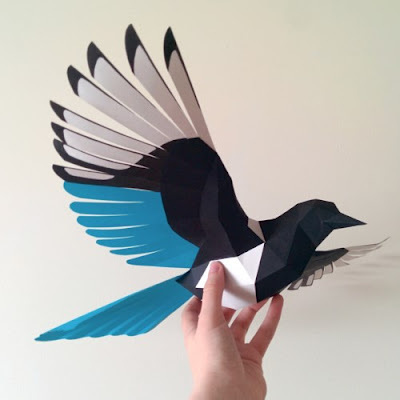 ^^ This papercraft was created by a Japanese designer. The template for the model (which consists of four A4 size JPGs) may be downloaded here. The exact species of scorpion this papercraft depicts is the Arabian fat-tailed scorpion which is found primarily in North Africa and the Middle East. Canon Creative Park has a nifty collection of free full head masks for the Halloween season. Pictured is my favorite from the group: a tyrannosaurus head! 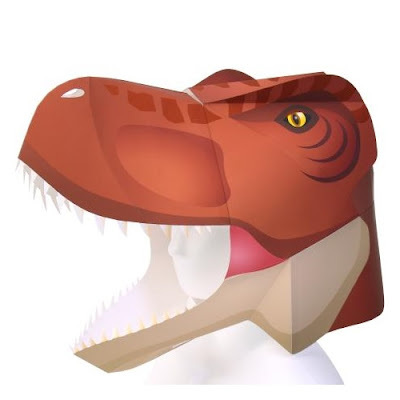 Masks also available for download include a triceratops, a pteranodon, a horse, a wolf, and an eagle. Ravensblight is the undisputed king of Halloween papercraft. 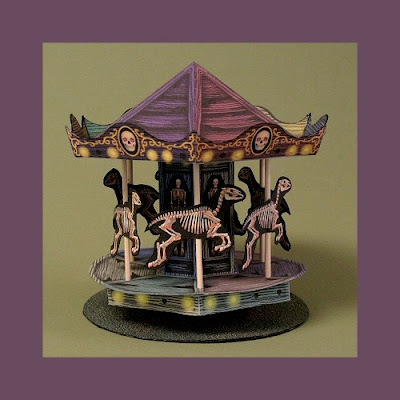 One example of the creations to be found at the website is this haunted Merry-Go-Round which actually spins. 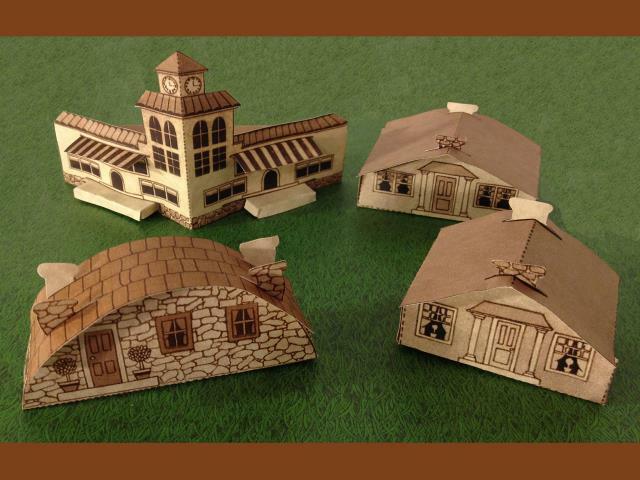 Also to be found on the site are enough paper models of haunted houses to create a Halloween village! Good Halloween origami designs are hard to come by, so I was happy to find this wonderful skeleton hand. 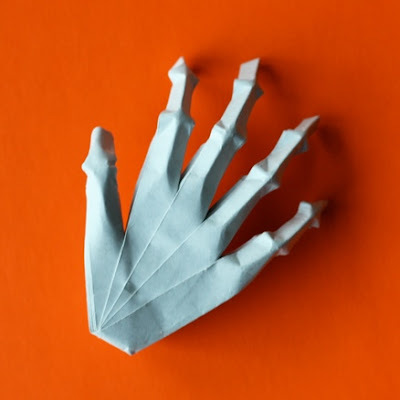 The original folding pattern for the hand was created by Jeremy Shafer. An excellent instructional video by Jo Nakashima on how to fold the hand may be found here. The build photo is by Jessica Jones. At first glance you might think this 1910 ocean liner paper model is the RMS Titanic, but it is actually another ship from the same time period: the SS Kronprinzessin Cecilie. Originally a German ship, the Cecilie was eventually taken over by the US Navy and renamed the USS Mount Vernon. The Mount Vernon served as a troop transport during World War 1 until she was torpedoed in 1918. A scan of the template for the model may be downloaded for free here. The scale of the papercraft is 1:200. Instructions are available in German only. 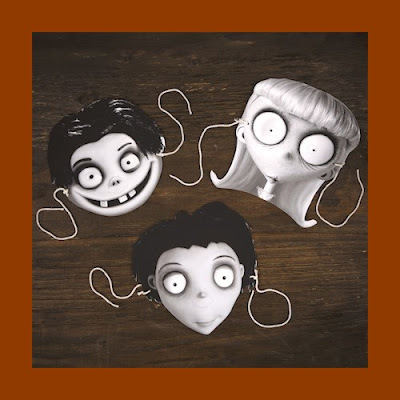 These printable Frankenweenie masks for kids were released by the Disney Family website a couple of years ago. Frankenweenie is the fourth stop-motion animated movie by director Tim Burton. The 2012 film was based on Burton's 1984 live action movie of the same name, which was in turn based on the 1931 movie, Frankenstein. A single PDF containing all three masks may be downloaded here. The Halloween season is upon us! Let the spooky papercraft begin! 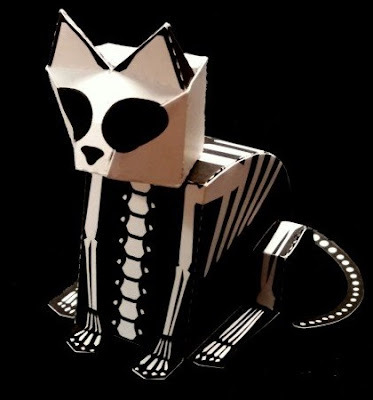 This skeleton cat paper toy was released by Digitprop in 2015, but I only recently discovered it. This kitty comes in two sizes: an 8 cm tall version and a 14 cm tall version. The template for each may be downloaded here. This 1/48 scale helicopter paper model was designed by Emil Zarkov. The download for the model includes four different templates, three of them easy, and one difficult. 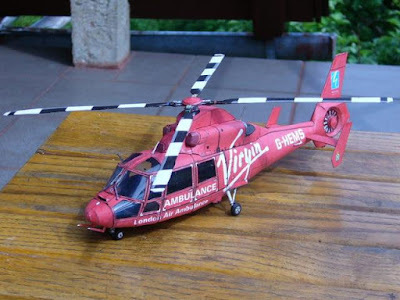 The helicopter depicted by the model is a Aérospatiale SA 365 Dauphin 2 with the paint scheme used by the London Helicopter Emergency Medical Service. The London HEMS is a charity organization that is funded in part by the Virgin company. This paper model is of a 19th century windmill that once existed near Mondorf, Germany. The windmill was demolished in 1923. This papercraft was released by the Kallboys club, a group of bowling friends from Mondorf who enjoy creating paper models of local landmarks. The PDF template for the model may be downloaded here. The download has very nice instructions with photos, but as to be expected, the text is in German. The three primary characters in the Harry Potter books are sometimes referred to as "The Golden Trio". The trio consists of the close friends Harry Potter, Ron Weasley and Hermione Granger. 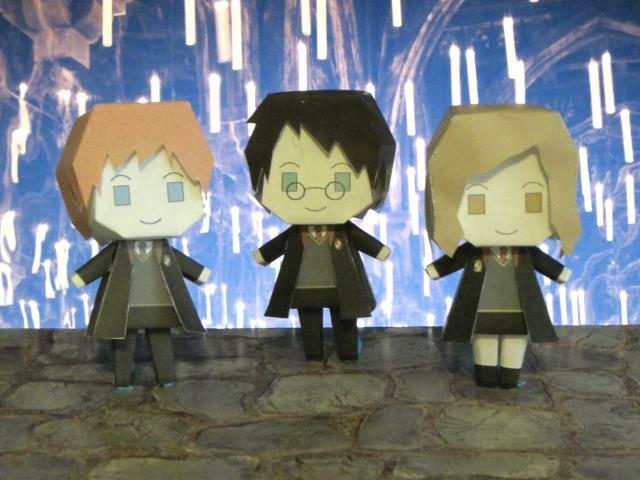 These cute paper toy likeness of the Golden ones were created by DeviantART member Zenturtle651692. The templates for the toys may be downloaded here. Often times 3D models from 1990's video games make the best paper models. 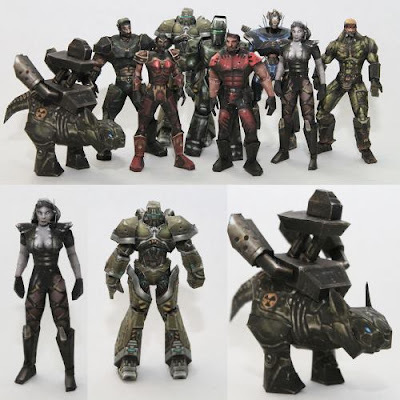 Case in point are these papercraft characters based on 3D models from the Unreal Tournament '99 video game. The game features first-person shooter death matches between an assortment of characters including soldiers, robots, and uh, whatever that thing is with two legs, a tail and no arms. :) The Pepakura PDO templates for the collection were created by Metalfist and may be downloaded here. In 1934, the Brooklyn Daily Eagle newspaper published a fifteen part series of papercraft buildings for children. Although billed as "fold-up houses", the collection also happens to include some commercial buildings as well. Because the models are monochrome, they somewhat remind me of architecture you might see in the black and white cartoons of the period in which they were produced. Scans of all 15 buildings in the series may be found here. One of the coolest things to be seen in the very first Star War movie was Luke Skywalker's hovering X-34 landspeeder. Sadly Luke had to sell the landspeeder in Mos Eisley to pay Han Solo for transport off the planet Tantooine. This paper model X-24 was created by Dave Winfield and may be downloaded here. 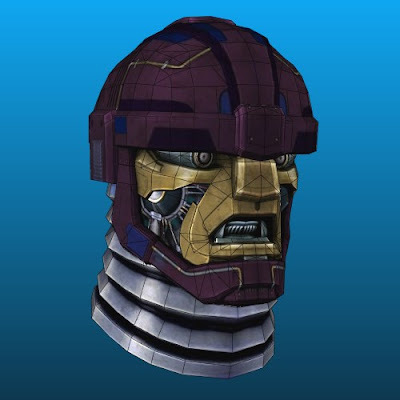 In the X-Men Origins: Wolverine video game, one of the bosses Wolverine must face is a gigantic Sentinel robot. This papercraft Sentinel head is based on a 3D model from the game. Available in Pepkura PDO format only, a download of the template for the model is available here. Unfolding work was done by PapercraftKing. If my daughter were still young enough, its highly likely these free Disney Princess paper dolls would be on our papercraft to-do list. 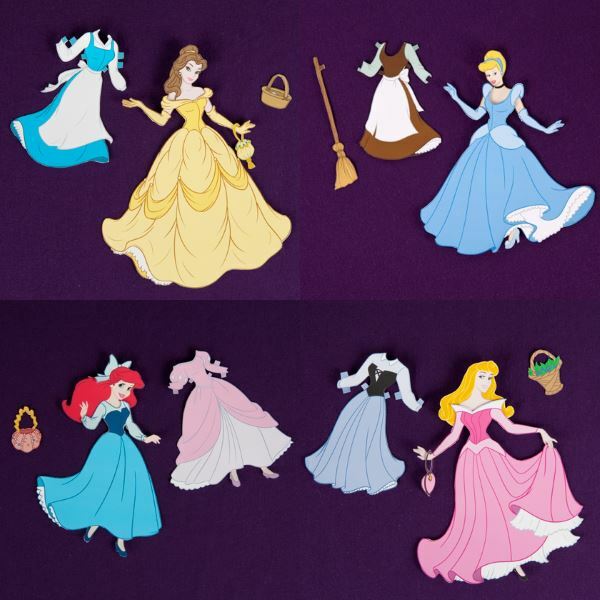 Released through the Disney Family website, these paper dolls are about as "official Disney" as it gets. Currently available are Belle from Beauty and the Beast, Ariel from The Little Mermaid, Aurora from Sleeping Beauty, and Cinderella. In case you're wondering, the Ariel doll does have a mermaid body hidden beneath those clothes. ^^ All four of the paper dolls may be downloaded here. This flying bird papercraft comes as an all white model that can be colored with any color combination you like. Gedelgo, the creator of the bird, chose to color it with the markings of a magpie. The template for the model may be downloaded at DeviantART. Magpies' natural habitat is western North America. They are a relative of the crow. 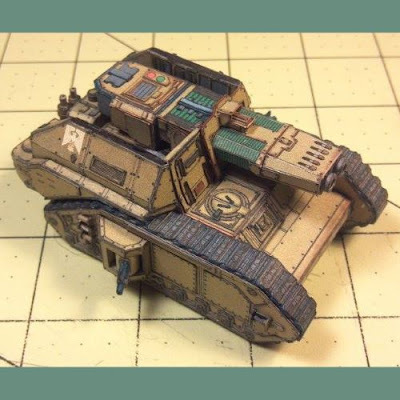 According to the Warhammer 40k wiki, the Macharius Omega tank is "a war-machine built with a single purpose, the battlefield deployment of the Omega Pattern Plasma Blastgun." A plasma blastgun operates by delivering lethal blasts of superheated matter to the target. This paper model of a Macharius Omega was designed by Eli Patoroch and may be downloaded here. 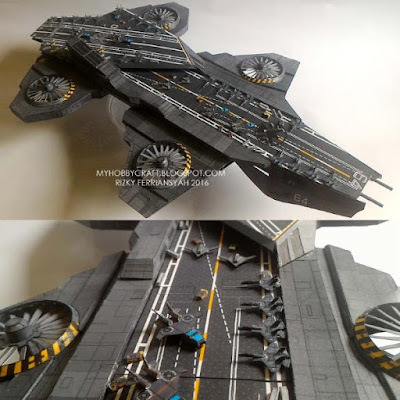 The build photo is by Dented-Rick who shrank the template down to 25% of the original size in order to build a mini version of the model. There are nine giraffe subspecies that live on the African continent. The most common subspecies seen in zoos around the world is the reticulated giraffe. 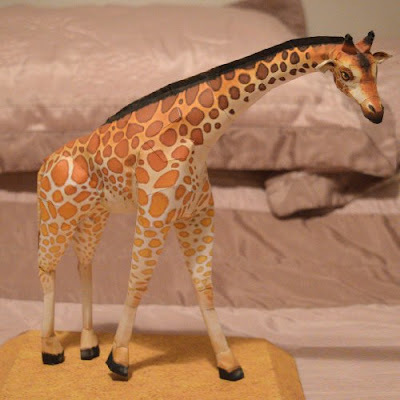 This paper model of a reticulated giraffe was created by DeviantART member DrWheelieMobile. It is based on a 3D model from the Zoo Tycoon 2 video game. A JPG template for the giraffe may be downloaded here. In the Pokemon anime, Ash Ketchum's Cyndaquil evolves into a Quilava during a fight with Team Rocket. Quilava is a fire-type Pokemon. It has five red spots on its body that are capable of emitting flames. 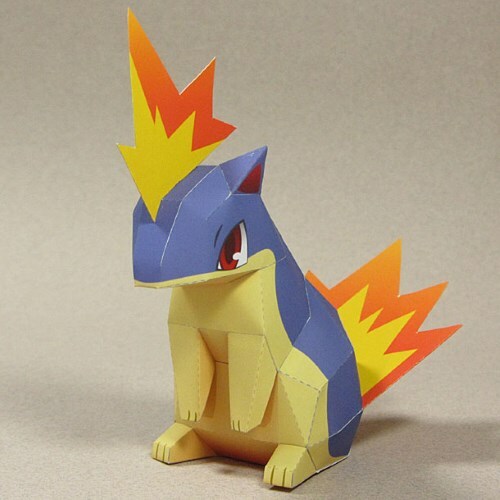 This papercraft Quilava is one of many Pokemon paper models available on the Japanese website, Tenpepakura. PDF and Pepakura PDO templates for this model may be found here. In Japan, Quilava is known as "Magmarashi". The Little Prince is one of the most beloved children's books of the twentieth century. Over the years since its publication in 1943, the novella has been adapted to movies, television shows, radio plays, and even ballet. 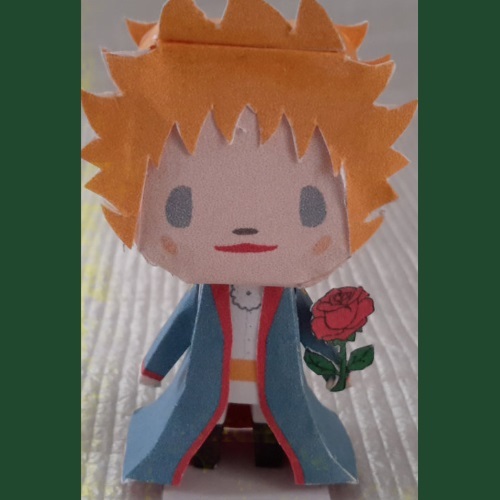 This fan art Little Prince paper toy by smilerobinson captures the sweetness of the original illustrations in the book. The template for the toy is available here. 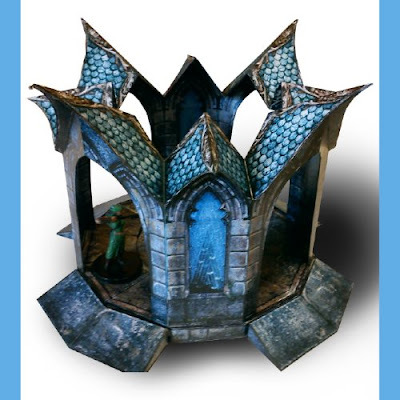 This paper model of elven architecture is a free sample from Lord Zsezse Works, a company that produces printable papercraft for miniature gaming. The formal title of the piece is "Eledriel's Cloister". The model has a strong "Lord of the Rings" feel to it and the creator of the piece undoubtedly had "The Mirror of Galadriel" in mind when designing it. Inside the cloister are rock benches and a fountain. If a free standing fountain is desired,the base of the model is removable. PDF files for the model may be downloaded here. This papercraft wargaming ship is a free sample from War Artisan's Workshop. 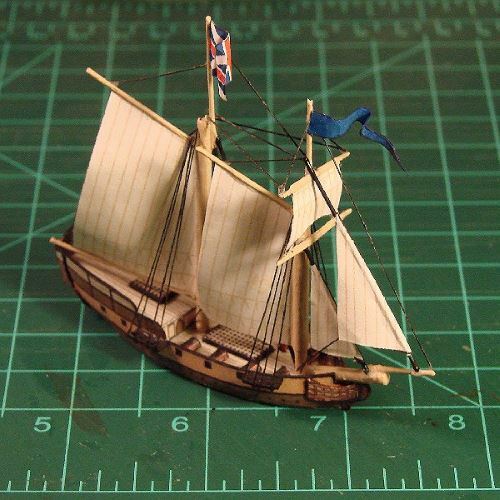 The model is a miniature representation of the 1775 sloop-of-war, USS Enterprise (the first ship to bear the name!) The scale of the ship is 1:300. Other materials required to build the model include toothpicks, wire, and thread. Tweezers are a must when assembling the parts! Photo instructions are included as part of the download. 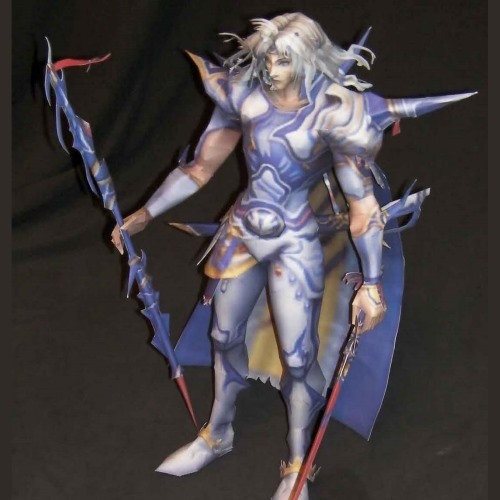 Back in the day, no one released more Final Fantasy papercraft than Kaizo. But alas, six years ago he gave up the hobby and moved on to other pursuits. Fortunate for those of us still building papercraft, most of his paper models are still available. Pictured is Kaizo's paper model of Cecil Harvey as he appears when wearing his paladin costume in the Final Fantasy: Dissidia video game. PDF files, a Pepakura PDO file, and photo instructions for building Cecil may all be downloaded here. You knew it had to happen sooner or later: the first Pokemon Go papercraft has been released! 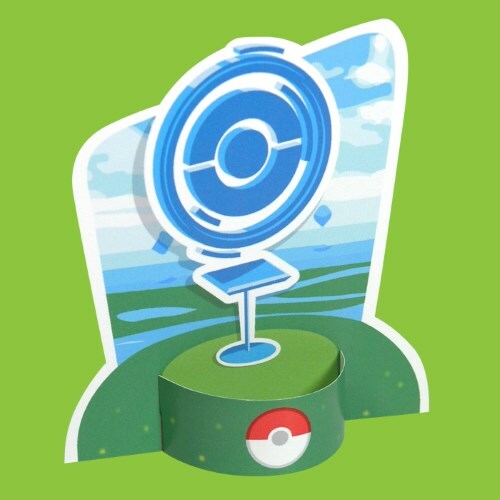 This easy-to-build, glue-less paper model of a pokestop icon was created by Desktop Gremlins. Pokestops are real world locations such as monuments, fountains, or public buildings which function (through the magic of GPS) as drop zones for items needed in the game. A pokestop icon indicates the location of pokestops on the in-game map. Now if I could just stop playing long enough to build this! ^^ Download is available here. 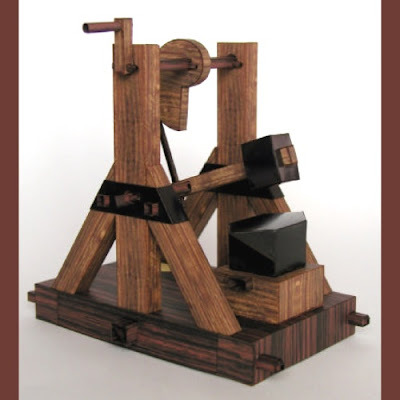 I have always enjoyed functioning models of Leonardo da Vinci inventions. Pictured is a papercraft version of da Vinci's "cam hammer", a labor saving machine for hammering metal. Steam powered machines like this were used hundreds of years after Leonardo's death during the Industrial Revolution. 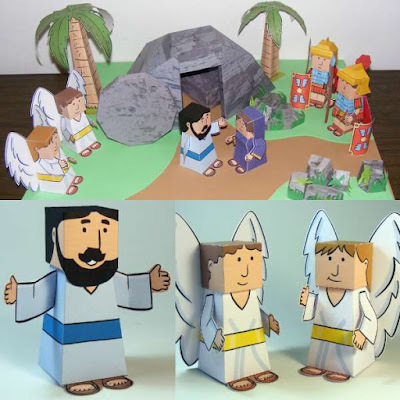 This paper model is the work of my papercrafter friend Giuseppe Civitarese and may be downloaded for free at his website, Paper Pino. In the Adventure Time animated series, Fionna is a fictional gender swapped version of Finn the Human created by the Ice King. 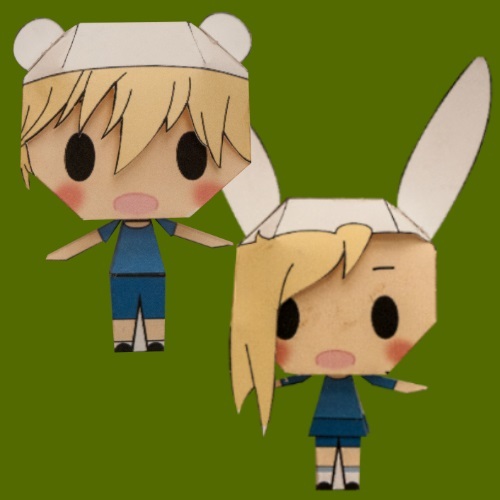 Pictured are paper toy likeness of Finn and Fionna created by DeviantARTist PiercePapercraft. Templates for the toys may be found here. Also available from PiercePapercraft are several other paper toys of gender swapped Adventure Time characters including Jake the Dog / Cake the Cat and Princess Bubblegum / Prince Bubblegum. 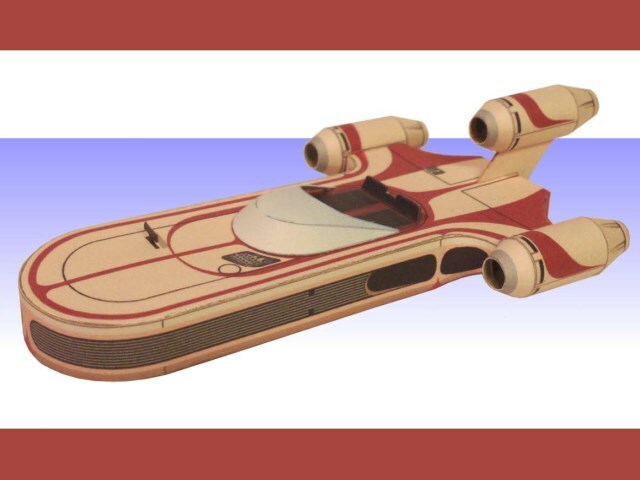 I like posting about papercraft from years gone by because many who are new to the hobby may have never seen them before. 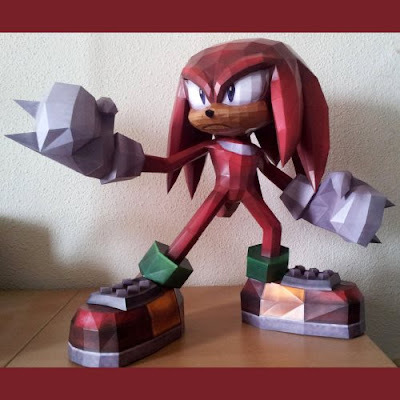 This Knuckles the Echidna model was created in 2012 by one of my favorite papercrafters, Destro2k. Knuckles, as you probably know, is a character from the Sonic the Hedgehog series of video games. Destro's template for the model may be downloaded here. 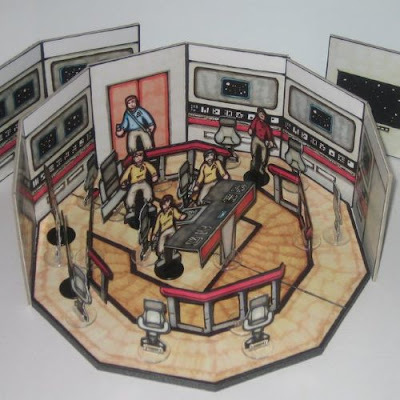 Here's a fun little papercraft playset of the Star Trek TOS bridge. The playset features hand drawn art and comes in an easy to assemble 2.5D format. The various pieces of the diorama may be found in the DeviantART gallery of MadunTwoSwords. The floor and walls work better when they are glued to cardboard or foamcore. I am always on the lookout for papercraft dice towers. Found one! 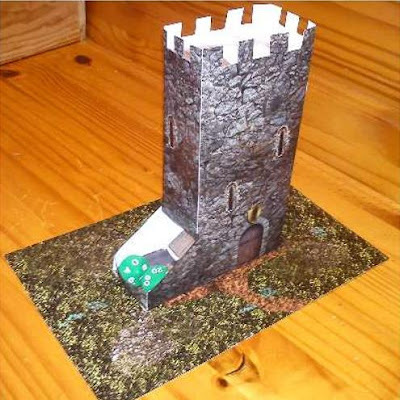 This printable tower is in the form of a castle (quite appropriate for medieval themed RPG games that make use of dice). Dice are dropped in the top and, by way of baffles inside, the dice are neatly rolled without falling off the table. The pattern for the tower was created by Marc Vela and may be downloaded here. Instructions are available in Spanish only. Designed by architect Frank Lloyd Wright in the early 1940's, the Solomon R. Guggenheim Museum has become a landmark building in New York City. Completed in 1959, the building was extensively renovated in 1992. As part of the renovation a 10 story limestone tower was added at the rear of the complex. 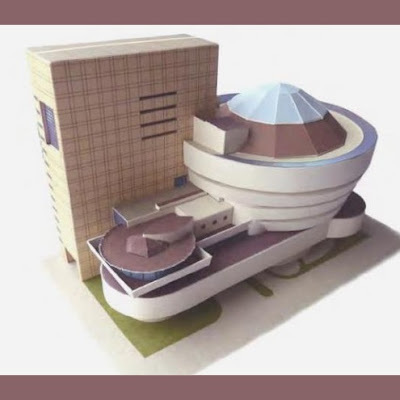 This paper model of the Guggenheim was created by Regína Orálková. A copy of her PDF template may be downloaded here. 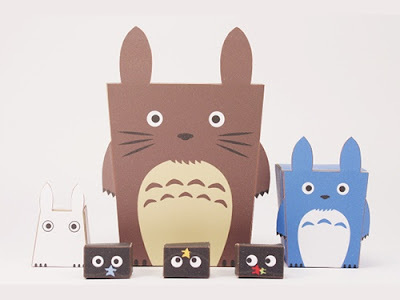 Finally, someone has made some easy to build Totoro papercrafts! This collection of paper toys from Cubefold is titled "Forest Spirits". Included in the collection are Oh-Totoro (gray), Chuu-Totoro (blue), Chibi-Totoro (white), and a group of three soot sprites (or dust bunnies as some like to call them). Each of the characters appear in the 1988 Studio Ghibli animated movie, My Neighbor Totoro. It took 13 years, but Pixar and Disney have finally produced a sequel to Finding Nemo. The new movie, titled Finding Dory, is set to be released June 17th. Looking to celebrate with some papercraft? 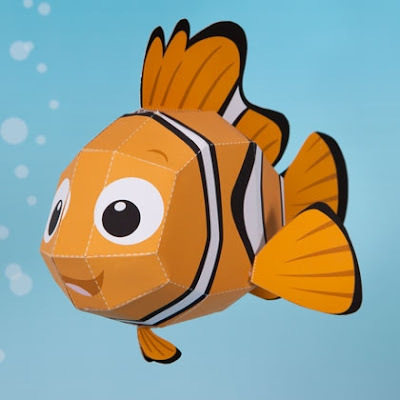 ^^ This official paper model of Nemo is offered for free at the Disney Family website (here). Instructions on the website claim the model can be built in 15 minutes! 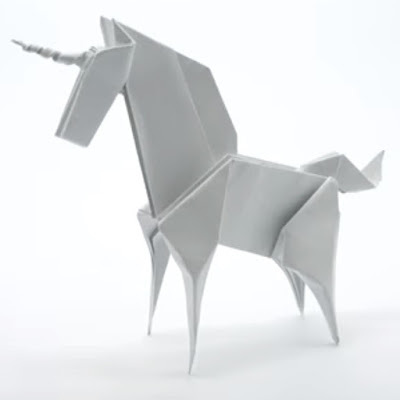 Origami artist Jo Nakashima has dozens and dozens of origami tutorials on his YouTube channel. Here is one of my favorites from the bunch: a unicorn! Jo's videos have a slow, careful pace that is helpful for those less skilled in the art (like myself ^^). Other origami tutorials by Jo include dragons, dinosaurs, rabbits, insects, and even a capybara! 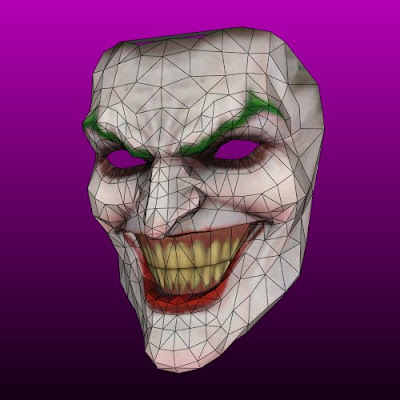 If I were looking for a Joker mask that is most true to how the villain appears in the pages of Batman comic books, I would look no further than this mask. The Joker's insanely evil personality is captured perfectly in the facial expression of the mask. But be warned, this papercraft is not for beginners. As the author explains, certain parts of the mask have no gluing tabs, so improvisation is required when gluing the mask together. The Pepakura PDO template for the mask may be downloaded here. In the Marvel Comics universe, the X-Men use a jet that is a modified version of the Lockheed SR-71 Blackbird. The X-Men's Blackbird was upgraded by the tech savvy mutant, Forge, to include, among other things, a cloaking device. 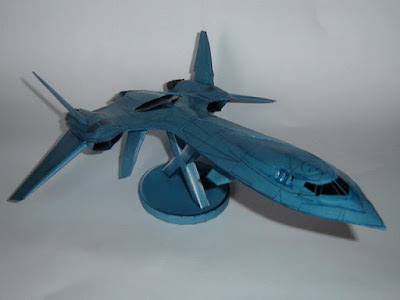 This paper model of the X-jet was created by Claudio Dias and may be downloaded here. In the Star Wars universe, both the Jedi and the Sith make use of holocrons. Holocrons are devices that store valuable information in holographic form. 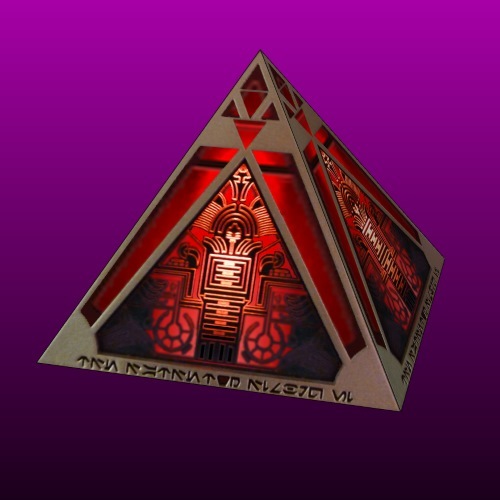 This paper model is of a Sith holocron which takes the form of a pyramid. In contrast, Jedi holocrons are typically cubes. The Pepakura PDO template for this holocron may be found here.